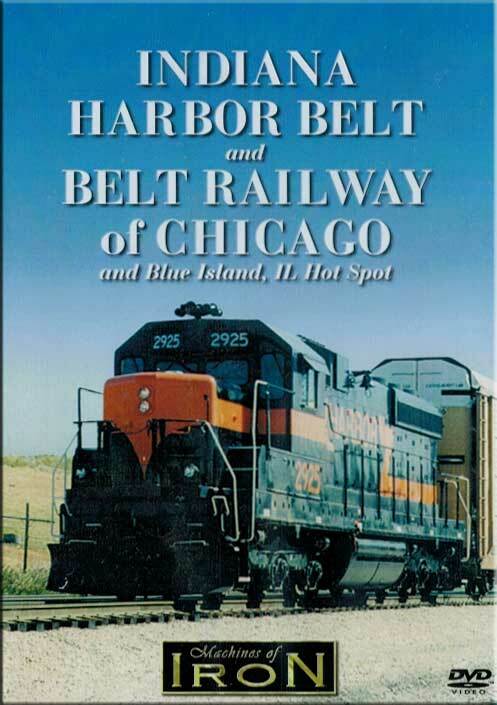 At roughly 40 miles long, the Indiana Harbor Belt came into existence 100 years ago as a switching railroad to serve the many industries in and around Chicago and Northwest Indiana. Today it's a completely modern operation that not only offers switching and classification services but, also a bypass around Chicago for freight trains from nearly every Class 1 railroad in the region. We follow the IHB's mainline from Franklin Park to the Port of Indiana. Included are a behind the scenes look at the Harbor Belt's Hammond shops, and Gibson and Blue Island Yards. The Belt Railway of Chicago's six Alco Century C424s are now gone. By 1999, the BRC decided it was time to remove their C424s from active service. We look back at the C424s as they plied the rails around Chicago And finally we'll visit Blue Island, one of the busiest rail junctions in Chicagoland. For sheer volume of train activity, Blue Island has to rank among the top. Trains belonging to Metra, the Grand Trunk Western, B&O Chicago Terminal, and the Indiana Harbor Belt pass through this busy junction. Papa Choo Choo (Tinley Park, IL) on 2014-09-24 11:28:02. I bought this specifically for The Belt Railway portion as I was employed there for 17 years. I found it interesting and nostalgic. The only thing is that I wish it were in Blu-ray instead of DVD. It played well though.